We're pleased to bring you the news of the latest enhancement to plotaroute.com. 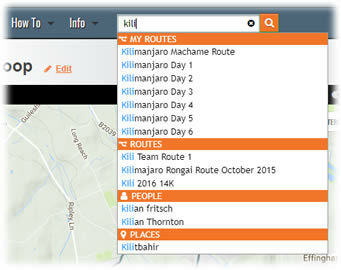 We've introduced some changes to make it even easier to search for your own routes using the Universal Search box. The Universal Search box (next to the menus) is an easy way to quickly find routes, people or places you know about. Previously all routes have been listed together, but we've have now made it even easier to find your own routes by placing these first in the results, under a separate heading. We've also made a few other tweaks at the same time, including making the search results wider, so that route names are less likely to be truncated. You'll need to be signed in to see your own routes listed first, but you can search for any other public route without the need to sign in. Of course, if you don't know the route you want and just want to browse routes or search for routes on a map, you can still do this.